For some anglers, casting lines in New England doesn’t get any better than the fly fishing Connecticut promises to deliver. From freshwater Salmon to Tuna, these waters are full of opportunities both large and small. With a game fish for every season and plenty of local enthusiasts to help you catch them, fly fishing is quickly becoming a favorite pastime in CT.
You’ll find ample opportunity for fly fishing in the Long Island Sound, whether you plan on wading or fishing from a boat. 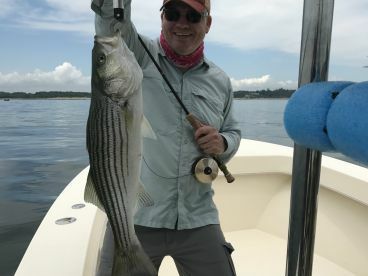 The area from Greenwich to Fairfield has a handful of places with easy access to the shore, where you’ll be just one cast away from Bluefish, Striped Bass, and other inshore species. Some of the hottest spots to fly fish from shore include Compo Beach, Holly Pond, Sherwood Mill Pond, and Penfield Reef. If you want access to bigger fish and more variety, book a charter and head into the deeper waters of the sound. You can enjoy excellent fly fishing no matter the structure, be it flats, rips, reefs, or small islands. 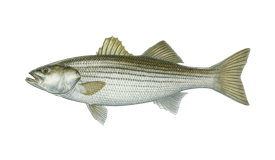 Good Striper fishing kicks off in May, followed by Bluefish in July. Both species produce lots of action through fall. 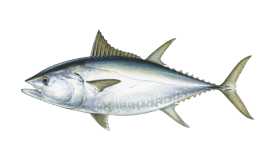 As winter approaches, these fish are replaced by False Albacore and Bonito. Connecticut boasts 8,400 miles of rivers and streams. Many of these are ideal fishing grounds for fly anglers, with some of the best action to be found in the Norwalk, Naugatuck, Saugatuck, and Farmington Rivers. A variety of species swim in these waters, but Atlantic Salmon and Rainbow, Brown, and Brook Trout tend to be the main attraction. Trout fishing is generally best in cooler months, but you can expect it to be excellent well into late April, May and even June on some rivers like the Norwalk. The west branch of the Farmington River boasts the highest Trout population density in CT, and you can expect good conditions here year-round. For local fly anglers, this river is the go-to place in summer when the water is lowest and the weather is hottest. The Naugatuck River provides some of the most unique fly fishing Connecticut has to offer, featuring broodstock Atlantic Salmon in addition to Trout. The state stocks anywhere from 800-1,600 Salmon in the Naugatuck and Shetucket Rivers each fall, and fishing for this species stays good into early summer. Most range from 5-10 lbs in size, but anglers hook into the occasional 30-pounder here and there. For those who are unfamiliar with the Naugatuck River, try starting by the pool at Pines Bridge Road in Beacon Falls. If it’s too crowded, Breen Field off of Exit 26 in Naugatuck is also good. If you’re heading to Long Island Sound, a stiff 8 to 9-weight rod will stand you in good stead. 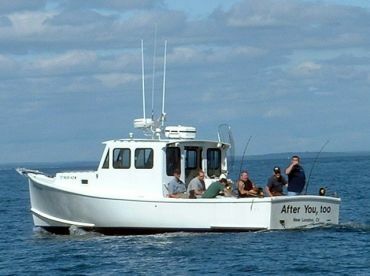 Combined with a large arbor reel, this tends to be the best multi-purpose outfit for anglers in New England. 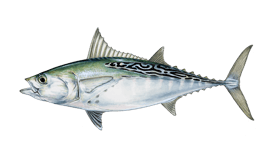 If you’re aiming for a trophy sized Striper or Bluefish, consider going with slightly heavier tackle. You can generally rely on a 9’ rod, though you may prefer something shorter when fishing from a boat or longer when casting from shore. A medium to full sinking line and 20 lb test backing are ideal. Fifteen to 20 lb test fluorocarbon is the most convenient material to use for your leader. When it comes to fly selection, there’s no better place to start than a local fly shop where the shopkeeper can tell you what’s working best at the time. In general, you can expect chartreuse-and-olive Clouser Minnows to stand you in good stead while fly fishing in the sound. It’s also recommended to bring a large set of pliers and a locking tool so you can grab fish by the jaw and remove your hook safely. 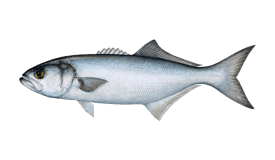 Bluefish in particular are very toothy and you don’t want to go sticking your fingers in their mouths when it’s time to remove your hook! Anglers tend to be more particular with rod selection when it comes to Connecticut’s rivers. Experienced fly fishermen often carry multiple rods and switch them out depending on conditions. For beginners, there’s nothing wrong with a 7’ 3 to 4-weight rod when targeting local Trout. In areas with more space to cast, a 9’ 4 or 5-weight rod is preferable. You can rely on basic flies like hare’s ears, wooly buggers, pheasant tails, and so on, but it’s never a bad idea to consult a local fly shop to see what the fish are biting. When it comes to catching Atlantic Salmon on fly rod, you’ll want to opt in for heavier tackle. A 7-9 weight rod should do the trick, paired with a mid- or large-arbor fly reel with a strong drag system and plenty of backing. A sink-tip line will get your fly well below the water surface without getting caught on rocks and tree limbs. A 6-7.5’ leader in 5-10 lb test line is recommended. Atlantic Salmon bite a wide variety of flies, from big bright pink, yellow, red, and white flies to small bead head nymphs and streamer patterns used to catch Trout. Anglers age 16 and older must purchase a Connecticut Inland Freshwater fishing license, available online. Trout and Salmon stamps are also required for those who plan to keep their catch. These stamps are also required for catch-and-release fishing in Trout Management Areas, Wild Trout Management Areas, Trout Parks, and Atlantic Salmon Broodstock Areas. Trout and Salmon Stamps cost $5 for resident anglers age 18 and above, or $3 for CT residents 16-17 years old. The cost for non-resident anglers age 16 and older is $5 (prices subject to change). Connecticut’s Atlantic Salmon season runs from October through November as a catch-and-release fishery only. From December through March, fly anglers may keep 1 Salmon per day. Some rivers have designated Trout management areas, which can lead to shorter open seasons and limits on fish that you’re able to keep. Be sure to learn more about local regulations before your trip. If you’re new to fly fishing, hiring a local guide can be the easiest way to follow regulations while fishing in the most productive spots. Many guides provide gear and bait, all you have to do is show up ready for an adventure!